Arts - Mexico - Juvenile literature. Central America - Social life and customs - Juvenile literature. Mexico - Social life and customs - Juvenile literature. 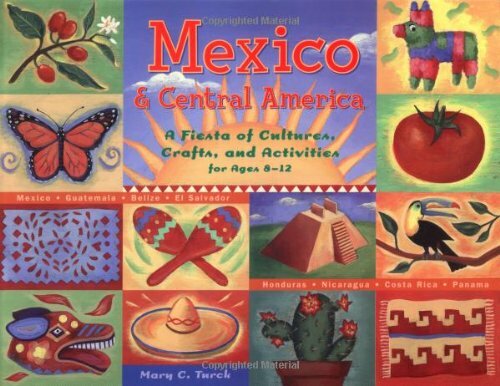 This multicultural activity book celebrates the myriad cultures of Mexico and Central America and their shared ancient Aztec and Mayan roots. For each country, a brief introduction is provided that includes illustrated maps and facts about population and geography. More than 40 projects and three dramatic play scripts explore the interconnectedness of these countries and help children experience aspects of daily life throughout the region including school, work, home, art and poetry, food and agriculture, and special holidays. Activities include embroidering Mayan designs, painting in the Salvadoran style, creating an ofrenda for the Day of the Dead, crafting political puppets, cooking chocobananas, and making pi�atas. Engaging sidebars throughout the book provide children with an introduction to the Spanish language. Also included are tips for teachers who want to use the activities in the classroom, complete with more specific age ranges and suggested modifications.